In osteoporosis prevention, diet plays a crucial role – along with exercise. While growing up you probably didn’t think too much about eating foods that could prevent osteoporosis. Sure, you enjoyed dairy products, but you’d be the first to agree, it had more to do with taste, than to promote bone health. Now that you’re older, your doctor might have expressed some concerns about your bones. You might even have heard him mention the word ‘osteoporosis’. Osteoporosis is a condition where bones become brittle and fragile because of bone loss. Even minor injuries are harder to recover from with osteoporosis. Preventing osteoporosis is key to avoiding injury and disability and continuing to live an active life. We know osteoporosis is a result of bone loss, but why are we losing bone? Just like many other functions in the body, your bones undergo constant renewal. In this process, old bone gets broken down and new bone is built. But, as we age, new bone growth slows dramatically, leaving much more old bone. However if you developed a lot of bone mass during your younger days by eating healthy and exercising regularly, your risk of osteoporosis is lesser than for someone who doesn’t have as much bone mass. Although osteoporosis can affect both men and women, it is most commonly found in women. That is because as women age, hormonal changes in the body can result in bone loss, which, in turn, can lead to osteoporosis. One means of preventing osteoporosis is through an osteoporosis diet plan. You can eat your way to stronger bones. If your doctor has raised concerns about your bones or you just want a head start in prevention, here is how to prevent osteoporosis naturally. If you’re concerned that you didn’t create enough bone mass growing up, don’t fret; there are foods that help osteoporosis, which you can start enjoying today. Bones require two essentials to keep them strong: Calcium and vitamin D. These are both elements that can be found in the foods we eat. If we plan accordingly, we can enjoy an osteoporosis nutrition plan that will meet the supply our bones need to stay strong. Calcium is stored within our bones. Bone density refers to the amount of calcium and other minerals within your bones. This, too, can decrease over time. Recommended calcium is about 1,200 milligrams a day which, as mentioned, can come from the foods we eat. Getting enough calcium may be problematic for some who have allergies or intolerances to dairy, but there are many other food options which can still help you fulfill your daily dose of calcium. Calcium also aids in the function of muscles, nerves and cells. As you can see, there are many different options when it comes to boosting your calcium intake. Enough, actually, to build an effective osteoporosis diet plan. One word of caution though. A recent study done by researchers at the Johns Hopkins University School of Medicine in Baltimore states that “excess calcium in the form of supplements may harm the heart and vascular system”. However calcium in dietary form is not a problem. So remember, if you want to strengthen your bones do it naturally with dietary calcium, instead of putting your body at risk with calcium pills/syrups/capsules. Vitamin D works hand in hand with calcium to ensure your bones stay healthy and strong. Vitamin D aids in the absorption of calcium, so even though you’re taking in enough calcium, without vitamin D you may not be getting all of its benefits. Lack of vitamin D can also lead to bone loss and lower bone density. Currently, adults over 50 should have 800 to 1,000 international units (IU) a day of vitamin D. This number may be different for some but should not exceed 4,000 IU, according to the Institute of Medicine. Now that you are aware of the recommended doses of calcium and vitamin D, as well as their role in bone health and the foods rich with them, it’s time to put together your osteoporosis diet plan. 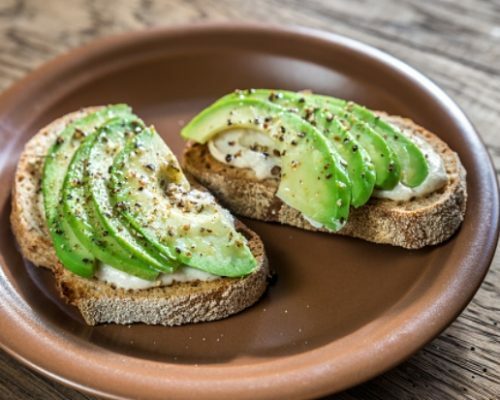 You have endless options when it comes to creating dishes that contain foods that help osteoporosis, but below are three recipes that can help kick-start your diet plan. From breakfast to lunch to dinner, these meals incorporate foods that help osteoporosis and aid in osteoporosis prevention. So why not begin your osteoporosis diet treatment today? Mash together the avocado, lemon juice, paprika and salt. Spread onto the toast and enjoy. Serves 1. Heat 1 tablespoon of olive oil in a medium sauce pan. Sauté the onion and garlic until soft and add the mushrooms. Cook until tender, and add the black beans until heated through. Add spinach to cook until just wilted. Season with salt and pepper. Prepare the beans. If you are using dried beans, soak them overnight, rinse them, and cook them in simmering water for 90 minutes. If using canned beans, drain them, rinse them very well and set them aside. If using raw tomatoes instead of tomato paste (if using tomato paste, move on to step 3) pour one cup of water into a soup pot and boil on high heat. Peel the skins off the tomatoes, roughly chop them up and place them in the pot. Stir them in the boiling water, allowing the tomatoes to soften and allowing the water to reduce, about 3 minutes. Lower to simmer, add in 2 tbsp. of olive oil and 3 pinches of sea salt, and stir together, mashing the tomatoes down with the back of the spoon. In the soup pot, sauté the diced onion, garlic, celery and carrots. Then add the chopped zucchini, green beans and broccoli. If you are not using fresh tomatoes, than at this point, add in the tomato paste. Also, add the parsley, basil, oregano, garlic powder and onion powder into the soup pot. Fill the pot with water to just over three quarters full, and allow the soup to simmer for 20 to 30 minutes. Dump in the cooked beans, and then turn the heat low. Using a fork, mash some of the softened carrots and tomato chunks against the sides of the pot, and then stir them into the water to color the soup broth. Stir in the tamari, salt and pepper. While the soup is still hot, throw in the fresh spinach leaves. Stir them in, allowing them to wilt. In a separate pot, cook the rice pasta shells according to package instructions, until tender (don’t overcook). Rinse and drain them, and add them into soup bowls just before serving (otherwise, if left in the soup pot, they will become mushy). Optional: Sprinkle shredded cheese on top of each soup bowl, just before serving. These food items are not only unhealthy, but they can aid in bone loss as well. So if you’re looking to prevent osteoporosis, avoid these bone-killer food items. Our diet has the ability to greatly influence our health, so by picking the right foods we can live well and experience strong bones for years to come. By knowing what to eat and what not to eat, your osteoporosis diet plan can be most effective. Strong bones mean a strong body and it’s not too late to start enjoying foods that help osteoporosis. Try some of the recipes provided or maybe whip up some on your own. It’s a delicious way to ensure your bones remain strong so you can live an active life, without worrying about osteoporosis.